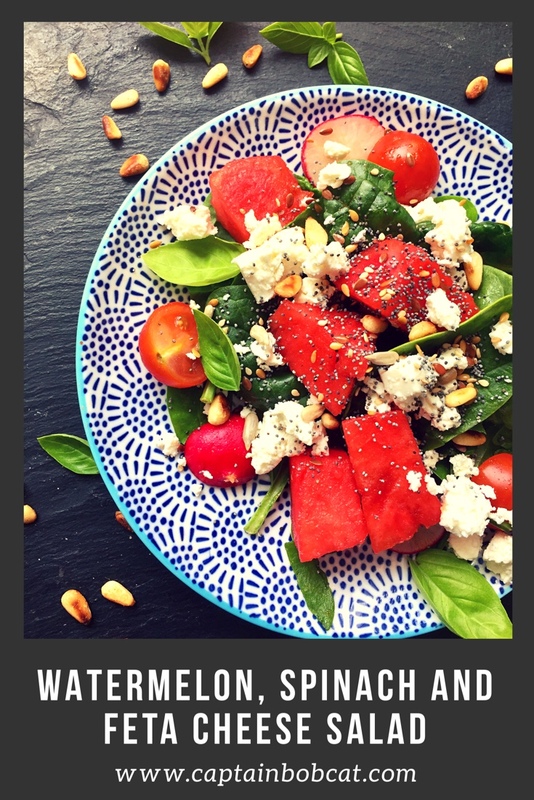 Blog Watermelon, Spinach and Feta Cheese Salad with Basil Recipe - The Flavours of The Summer! 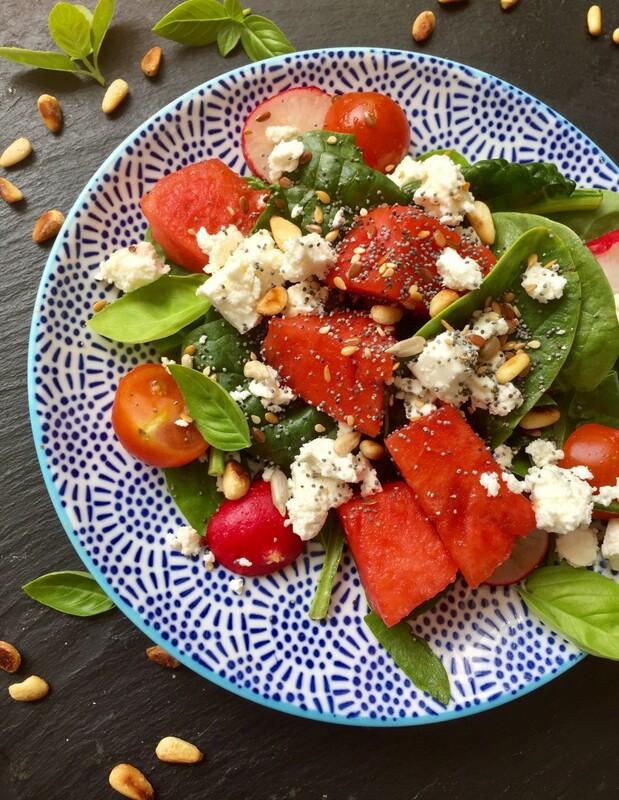 Watermelon, Spinach and Feta Cheese Salad with Basil Recipe – The Flavours of The Summer! This has been my favourite salad in the past few weeks, it’s so yummy and bursting with flavours that it does make a perfect, standalone, light meal. Like lunch – especially in the hot weather. 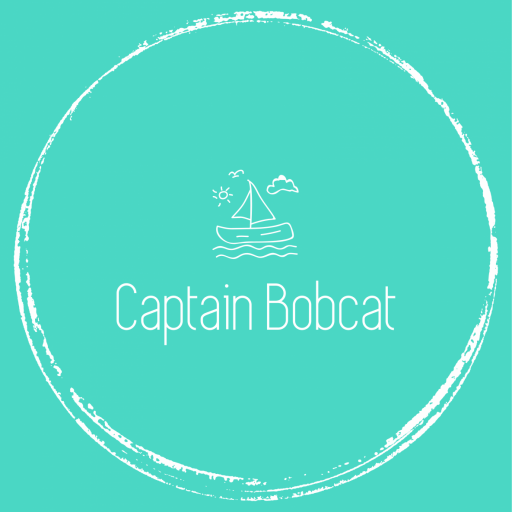 Gives lots of energy and trust me – I’m normally hungry all the time – it is quite fulfilling. It’s super healthy an nourishing as well: the spinach being packed with Vitamin K, A and C, folate, as well as known for it’s anti-inflammatory and antioxidant abilities. 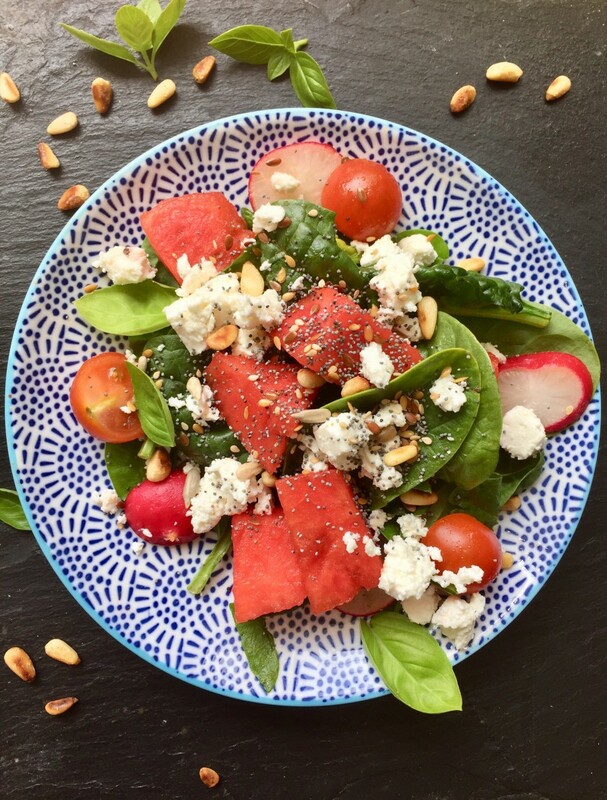 The combination of the watermelon, creamy and tangy feta cheese and the fresh veggies and herbs results in a total flavour burst – this has to be one of my favourite summer salad recipes. You can sprinkle it with toasted pine nuts and other salad seeds like poppy, linseed and sunflower seeds for some extra crunchiness. The first time I made this salad I actually served it as a starter – but it was just so yummy that I ended up having nothing else but this salad for that meal. Enjoy this lovely, flavoursome, summer salad recipe. Yummy summer salad - a full meal and full of flavours! Place the ingredients in a large bowl: spinach, watermelon, radish, cherry tomatoes, basil. Toss with olive oil. Combine well. Toast the pine nuts in a small frying pan. I absolutely love veg-fruit-cheese salads, my favourites! I absolutely love watermelon and have never considered adding it to a salad before but I will now! Tempted to make this with vegan feta! Yes, I think you can swap it for vegan feta I think, it’s the same salty cheesy taste. This looks SO good! I would never have thought to add watermelon to a salad. It’s sounds a perfect light and refreshing meal for the summer. You should try it it’s surprisingly yummy. Oh I love salads in the summer! I’ve not tried this combo but watermelon and feta sounds delicious! Oh lovely, I’ve never had watermelon in a salad before. It sounds really fresh and healthy.